Looking as awesome as ever. You keep doin’ that Lucario. 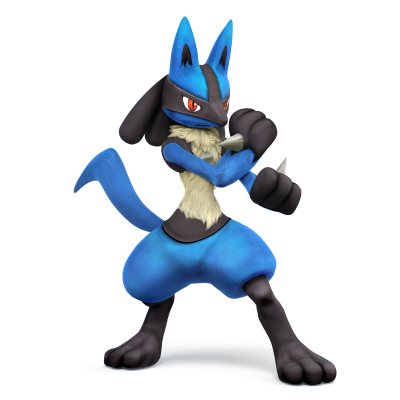 To the surprise of pretty much every Smash Bros. fan, Lucario was confirmed today. People were taking Mewtwo’s removal from Brawl as a clue and expecting Lucario to be replaced by a character such as Zoroark. His return was confirmed today by Sakurai via the Smash website. More details will follow. The screenshots released alongside his announcement reveal little, but it looks like his moveset has not been overhauled and is quite similar to Brawl’s. He still has his Aura sphere and downward smash, but not much else is known about what changes he’ll have. In case you didn’t know, in Brawl the more damage Lucario had, the more he could deal back with his Aura attack. What Sakurai said reveals that he has now become a powerhouse. The announcement comes three weeks after Sakurai’s last reveal. So far, only 22 characters have been announced, whilst Brawl had a roster of 36 characters (including dual/alternate characters such as Zero Suit Samus and Sheik). Sakurai has stated that the roster will be at least the same size, so we should expect to see more announcements with more frequency, especially if the game is to be released in 2014. The question everyone is now asking is: does this confirm that Mewtwo will not return, or just pave the way for his future announcement? This entry was posted in 3DS, Nintendo, Wii U and tagged 3ds, gaming, Lucario, nintendo, pokemon, smash bros, Videogames, wii u. Bookmark the permalink.